The Campaign for a Commercial-Free Childhood has filed a Federal Trade Commission complaint against Your Baby Can Read! for false and deceptive marketing. 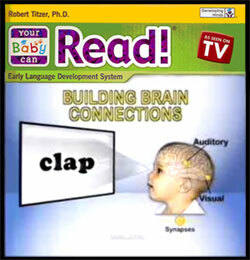 YBCR is a $200 video-based system that allegedly teaches babies as young as three months to read. The Today Show did a great story on our complaint, and we’re already hearing from parents who have been duped by the company. Reading experts from around the country agree that baby’s brains aren’t even developed enough to learn to read. Reading is more than memorizing what a word looks like on a flashcard—it requires comprehension. Like other baby media companies, Your Baby Can Read exploits our natural tendency to want what’s best for our children. There is no evidence that babies learn anything—let alone a complex skill like reading—from videos. And in addition to conning parents out of $200, Your Baby Can Read’s false and deceptive marketing may be putting babies at risk. The complaint is part of our ongoing effort to stop baby media companies from marketing their products as educational. Last year, we successfully persuaded the Walt Disney Company to stop marketing Baby Einstein as educational, and to offer refunds to parents who believed their claims. Research has linked infant screen time to sleep disturbances and delayed language acquisition, as well as problems in later childhood, such as poor school performance and childhood obesity. If parents follow Your Baby Can Read’s viewing instructions, their baby will have watched more than 200 hours by the age of nine months—spending more than one full week of 24-hour days in front of a screen. Meanwhile, the American Academy of Pediatrics recommends no screen time for children under age two. The last thing babies need is to be drilled with flash cards and to watch videos. It’s particularly worrisome that screen time takes away from the two activities known to be educational—time with caring adults and hands-on creative play. Babies learn in the context of loving relationships, and with all of their senses. Yet, 19% of babies under the age of one have a television in their bedroom and 40% of 3-month-olds are regular viewers of television. And we all know that screen time is habituating. The more time babies spend with screens, the harder it is for them to turn them off when they’re older. If you bought Your Baby Can Read and you’re dissatisfied, or if you’re outraged on behalf of parents who bought the product, please click here to let the FTC know that you want Your Baby Can Read to stop its deceptive marketing and compensate parents who shelled out $200 believing they were doing the best for their children. Thank you! God this is so great that you are documenting this stuff and fighting against it. It's really terrible for companies to prey on parents' anxieties over their children falling behind (before they're even born!) and market this stuff as educational when it's actually antithetical to how they learn. People are also trying to get kids to focus at way too young an age. There was a great NY times article a ways back about how kids can't not pay attention-- to everything around them -- which means they can't block it out to focus on one thing (and shouldn't, in the case of flash cards, "educational" videos, etc.). You are on a great mission and your work is so needed. Thank you. Thanks Rachel. The commercialization of infants and toddlers--and the push to get them in front of screens--is of major concern to me and to CCFC. We're so glad to be able to take this on, and for your support. I bought YBCR and am VERY happy with the results. My son is now 5 and reads at a grade 2 level. School is not frustrating for him, he LOVES to read and learn. This program did not damage him, it made him so interested in print. And while he may have spent 20-40 mins a day in front of the TV, we watched it TOGETHER, cuddled up with a bowl of cheerios. Has for forcing him to do flashcards. He begged to see them. It helped open his eyes that words mean something. I was able to harness the early stage of his life where the brain is a sponge. Now we sit for 7-10 books before bed. He reads me half of them. He still have PLENTY of time for free play, time outside, play groups, etc. He has tons of friends, loves playing with playdough, and trucks. I run a home daycare and all the parents are thrilled that I am teaching their babies to read. One month told me there are so many differences between her older son who I did not watch and the son I currently have in my care. She wishes she knew about this when her oldest was a baby. If the parents that say it doesn't work just sit their kid in front of the tv and never spend the time to bond together with books. NO WONDER it didn't work. I taught both of my children to read as infants. YBCR was one tool that I used. My first daughter was reading phonetically at 21 months. She could read 100 page chapter books in less than two hours before she turned 5. She was only tested up to a second grade level for Kindergarten. But she read rapidly with 100% comprehension. She decodes at an approx. 5th grade level. My second daughter just turned 3. She asks to do baby reading everyday, referring to either Brillkids or paper flashcards I print. At this age, they absorb written language. They don't need to be forced to learn like schoolage children. I appreciate the desire to reduce screen time. A great way to do that is to teach children to read early. That way they can read to themselves at a very young age. My eldest daughter just turned 6. I have a hard time supplying her with books because she reads them so fast. She spends a lot of time reading everyday. She would rather read than watch TV. Every parent should teach their children to read early. It isn't about anxiety or wanting your child to get ahead. It is about helping them reach their potential. They can learn so easily as infants. I hope parents who have had success teaching their infants to read will contact the FTC in support of YBCR. I definitely will. I have the entire Your Baby Can Read series and both my sons enjoy watching it. I used this series along with other resources to teach my sons to read. My older son who is 4 years old can independenty read up to Grade 3 level based on the San Diego Quick Assessment and he can read most of the words presented at the Grade 4 level. As for comprehension, he could understand the original railway stories by Rev W Awdry when he was 3. He would use railway terms he heard in the stories correctly when playing with his trains and creating imaginary scenarios. He happily sits in his reading corner reading books to himself and he prefers to go to a bookstore over the toy shop. There are many parents who have successfully their babies to read. Just search through Youtube and you will see some of the many examples. I am a parent of a 6-month-old child who has started with the Your Baby Can Read program. With the results other parents are getting with Your Baby Can Read and right brain education resources, I am more frightened with this campaign against it. I am frightened for the parents who will be deprived the chance to gain access to these programs because of this campaign. So, I will proceed with the learning programs I am using on my 6-month-old. The evidences in other children speak louder than the words I see here. Thank you very much. "Overall it saddens me to see that Dr. Titzer is being punished for trying to help people realize babies full potential"
This statement pretty much sums up what is wrong with YBCR and every other baby education program. Parents who are overly concerned about helping their child "reach his full potential". It is my firm belief that children will realize their full potential on their own, in a loving environment, with plenty of opportunity to play creatively. If your child is a prodigy, he or she will be a prodigy whether you sit in front of him with flashcards or not. Everybody wants their baby to learn as much as possible, and there is nothing wrong with that goal. The problem comes in when we assume that the way babies learn is anything at all like the way adults or older children learn. It isn't. Everything that is meaningful for your baby to learn in the first few years of life comes from play and close relationships with caregivers. I guess if you sit WITH your child and do YBCR, it can't really hurt, but what's the point? So you can go to your mommy and me group and brag that little Bobby picked up Anna Karenina at the library for some light reading? Whatever helps you sleep at night I guess. I think its pathetic that someone actually took the time to campaigne against this!! Perhaps the program didnt work for your child because you didnt spend time with them? Maybe because you were more worried about them playing then learning and playing? No one is saying not to send time with their child nor is anyone arguing that having your child watch tv for hours a day is healthy BUT look at all the babies this program has helped. I will continue to use this program as my son gets older and look forward to reading with him. Maybe you need to spend less time complaining and trying to shut down good things and focus more on your one on one time that you preach is so important. "This statement pretty much sums up what is wrong with YBCR and every other baby education program. Parents who are overly concerned about helping their child "reach his full potential"." Reaching potential refers to increasing the odds of a child achieving academic success. Only 38% of American 12th graders read at grade level. Far less are proficient in math. If more parents were concerned about their kids' "potential" we wouldn't have so many kids dropping out of school or graduating with worthless diplomas. I can't understand how anyone could laud parents who don't care about their kids' futures and condemn those who do. i'd like this ybcr could be good, depending how its used. if parents are using it in replacement of other tv shows, no it isnt going to be at all beneficial. and no, the baby cant actually read but they do learn to recognize a word both written AND spoken. my daughter watches no tv, at all. every now and then, i will put the dvd on.. once. and thats it. other times i used the flash cards with her... IF she'll stay still and she's into it. those statistics about obesity and what have you, more than likely come from those parents who just park their kids in front of the tv anyway! ybcr has the potential to be an excellent idea and program, but cant be used to replace normal tv and it cant be just the child watching a screen. kids and babies learn more by interaction, and no matter how hard you try to make a dvd or tv show interactive, it isnt. i personally like ybcr, BUT i dont just park my daughter in front of it all day. she watches NO tv(has no interested in doing so, anyway) and she may watch the dvd once a day, if that. other times, we do the cards and interact. I couldn't agree more. For baby or even toddlers, playing is the best learning for them. I think teaching a child to read early is great but we should do it gradually and naturally. I LOVE this program. My kids LOVE this program. They love learning and they love being able to communicate with these words. It's really sad that an inept group of people have been able to bring this company down. If you don't like the program, then don't use it. If you don't want to use it properly, then don't use it. It's that simple. Their claims are not false. My kids are living proof. Sad. Well the FTC finally acted! congrats.